On Saturday I made a lovely little trip to Slaithwaite, in West Yorkshire, with my dad and sister. We decided to make the trip after coming across Rumpus Burger on Instagram and we are so glad we did. Rumpus is such a hidden gem, a lovely building, which is supposedly converted from an old toilet block. It is only very small but, super rustic and quirky inside, with tractor parts attached to the wall and wooden tables and chairs. When you enter, you enter on the ground floor, where the kitchen is/where you can order takeout. You are welcomed by some lovely staff who showed us to our table upstairs. There is only around 6 tables so I would 100% book to guarantee a table. 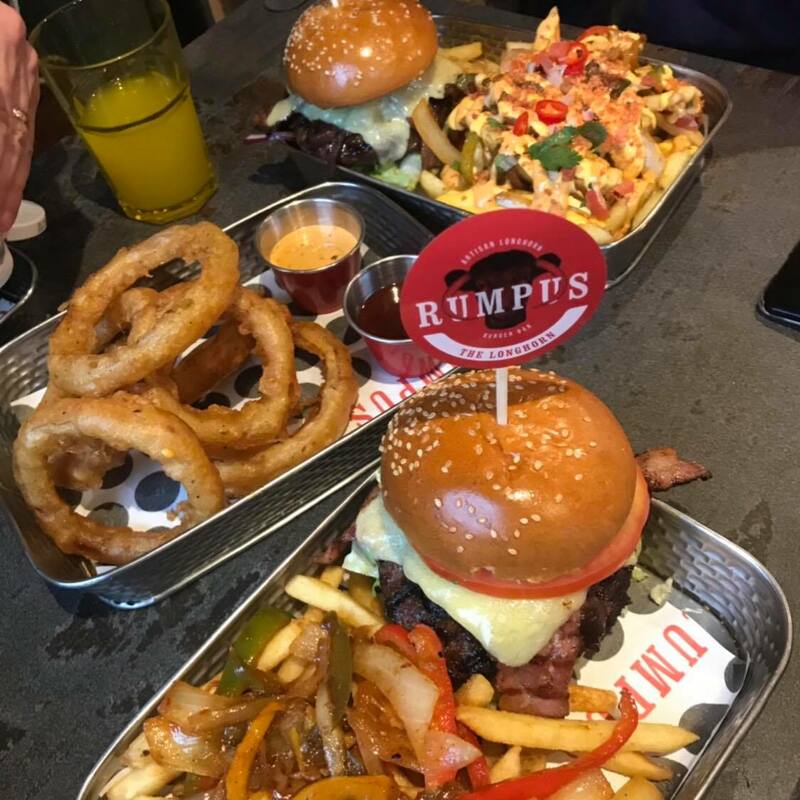 Rumpus serves artisan burgers using local longhorn cattle reared on their very own farm only a two minute walk from the restaurant (you can’t get food any more local than that). They also have options such as naked burgers, chicken and also a veggie option. With great sides including, onion bhajias and halloumi fries. Seeing as though it was my first visit I had to get their The longhorn, a burger that everyone had said to get when I told them I was making the trip here. It consists of a Colne Valley 6oz Longhorn burger, served with smoked cheddar cheese, caramelised onions and crisp streaky bacon, tomato, cos lettuce, red onion and dill pickle. All burgers come with either fries or a salad, however, I decided to upgrade to their salt and pepper fries. The salt and pepper fries come with sauteed peppers, onions and red chillies with a Chinese style seasoning. The burgers are cooked pink unless you ask otherwise and they were honestly incredible. Super juicy, packed full of flavour, I could eat one everyday! The fries were great too and you got so many! The portions are super generous to say it only cost around £12. The only thing, is that it was that big it collapsed in my hands, so I had to be that person that ate it with a knife and fork, hahaha! My sister got the same burger as me but upgraded her fries to Funky fries, which are drizzled with cheddar cheese sauce, chipotle mayo, sauteed pepper, onion and chillies, pico de galo and bacon crunch. These looked amazing! And just like myself, had to take half of them home to eat later. I think our eyes were bigger than our bellies when we decided to upgrade to loaded fries as the burgers were huge just on their own. If you dint think we had enough food we also got a side of house onion rings and a pot on baconnaise (the best sauce). These onion rings were huge, as you can probably tell in the photos, and the batter was so good and crispy. The best onion rings! My dad went for The Classic burger, which is a Colne Valley 6oz burger with tomato, red onion, cos lettuce, dill pickle and a choice of cheese. My dad asked for it without cheese as he doesn’t really like it and added streaky bacon instead. Unfortunately, they ended up giving him it with cheese. He ate it anyway and said he could barely taste the cheese and was the only one to demolish the huge portions (secretly I think he is starting to like cheese). Rumpus is a lovely hidden gem in Slaithwaite, that in my eyes serves some of the best burgers I have ever tasted. Using locally sourced ingredients and even beef from their own cattle, it truly celebrates Yorkshires produce. I would 100% recommend this place to any burger lover as it was amazing and I shall be rushing back! It would even be great in summer as you can get takeout and eat it on the picnic benches opposite. I hope you enjoyed another review and let me know your opinions of Rumpus Burger or any other places you think I should visit, in the comments below!